Most Americans, myself included, are profoundly proud to live in this country. Despite our pride for the country, we still tend to distance ourselves from the war. Whatever the reason, we don't seem to think about it in our day to day lives. We go about our comfortable lives in our self-made little bubbles. Not that we intentionally take on the mind set of forgetting about the war efforts and the truth of the matter is, we shouldn't. The war is not a matter to be swept under the rug, like it doesn't matter or it isn't happening. Whether or not you support the United States war efforts or choices isn't really the subject matter of today. The subject is our troops and the families they so often leave behind. Our soldiers are not robots. They are flesh and blood like you and I. They feel the burdens and the sadness of leaving their families behind. They face fears and deal with emotions on a heightened level. They believe in all the beautiful and good things America stands for and they are willing to do their part to ensure those liberties and dreams. We, the American people, have an obligation to these men and women of the armed forces along with their families to show our support. They have earned our standing ovations with a round of heart felt applause. I encourage you to break away from your bubbles. Remember that there is very much a war happening and those troops need our love! Lets remove ourselves from the mind set of forgetting and lets start remembering how important our troops, their families, and our veterans really are. May I recommend sending letters or care packages, sharing some words of affirmation to a military spouse, or simply hang a yellow ribbon. All in all honor of our women and men in our armed forces. After all the display of vast bravery and sacrifice our troops, past and present, is what makes this country what it is today. Be sure to come back and visit my little corner of the blogging world more often this month. I have some excellent interviews planned with some of America's protectors and family members. I do so hope you will return to see what they have to say and show a little support to the efforts they are making. What can I say folks, thinking about what the Fourth of July really means sparked my patriotic side!!! 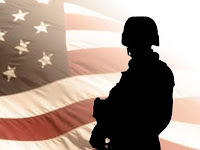 Here are some links on how you can help support our Troops!